All the islands of French Polynesia are of volcanic origin, what created isolated and sparse islands, far away from any continent. Thus most of the the plants that constitute today a diverse and luxuriant vegetation were imported and acclimated by men in two successive waves. Polynesian immigrants -who may have come from South-east Asia- brought on their canoes the typical fruits of their region that they needeed to survive during their long trip across the Pacific ocean : banana trees, coconut trees, bread fruit tress… Those plants are considered today by many people as indigenous. Four banana species in total grow in our islands, two of which are indigenous to French Polynesia and can only be eaten cooked (fei and meia), and two others introduced by the Europeans that can be eaten cooked or raw (rio and hamoa). Except the fei that grows widly between 400 and 1,000 m, the other varieties are cultivated here and there in the littoral of all high volcanic islands. Banana trees trunk has always been largely used by Polynesians : embarked on canoes during long trips, it was used as forage for the animals ; notched, it produces an indelible sap ; used as fuel, it provides the Tahitian hoven in vapor essential to avoid carbonization ; and finally its fibers are used for weaving. Its big leaves can be used as tablecloth and as container to cook the aliments in the Tahitian hoven. As for the fei, it is greatly prized notably cooked in the Tahitian hoven or prepared in poe, a sort of Tahitian pudding served with coconut milk. Unfortunatly, the fei is more and more rare today and is not anymore the food base of the more humble people because of its price. As caviar was used to feeding chickens, nono (or noni) fruits were given to pigs since an American company decided to use it to make a flavored juice that is said to cure, or at least, to prevent all deseases. The nono, that was once a wild bush growing near the sea, is now highly cultivated in all archipelagoes to provide this new and florishing industry. Thus, some cultivators go so far as to uproot their vanilla feet -once the true “brown gold” of the Pacific islands- to plant nono. Formerly, Polynesians used the nono fruit to cure the stone fish sting -a poisonous fish living in lagoons muddy bottom- or to cure sore throats. Roots and bark were used to paint tapa, a sort of vegetal cloth. The uru destiny is quite singular for it was the centre of covetousness in the XVIIIth century. Considered as indigenous, this plant was discovered in the Marquesas islands by the navigator Quiros in 1595. After Cook’s travel, the uru fame didn’t stop to raise in the British Empire : no sooner, the West Indies planters asked for seedlings in order to produce for slaves a food more nourishing than manioc and cheaper than rice. Captain Bligh, commanding the very famous Bounty, was charged to collect some seedlings in Tahiti and then to transport them to West Indies. The mutiny -that put an end to the expedition and was made famous by films- was launched, among other hazings, by Bligh’s order to reduce the crew water rations in order to sprinkle the young trees. Then, other expeditions were send and some uru were planted in West Indies but they never had a comparable place to the one they have in Polynesia. Actually there are some 25 varieties of uru : rounds, oval, smooth, rough… and the interest of this tree is not limitated to its fruits since it is also a very used medicinal plant and its bark permits to make tapa, a sort of vegetal cloth. What is commonly called citrus in French Polynesia is actually a pre-European variety named “lime” : it is the local taporo which small and hardly spherical fruit is used to prepare raw fish. As for the taporo popaa (foreign citrus), quite bigger and elongated in shape, it was introduced by Europeans but it is not very cultivated. The local taporo is more resistant to insects and deseases than the orange tree, however it was not spared by attacts and for the actual production is lower than the demand, limes are imported from the Marquesas islands or even from Australia. 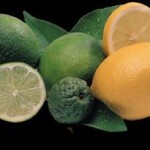 Nevertheless, the local lime is a very important element in traditional medicine since it is used in aproximatly twenty preparations. The mape finds its origin in Malaysia and might have been brought in French Polynesia by the Polynesian immigrants from South-east Asia. This tree is characterized by foothills that develop from roots to branches for the oldest ones. Boiled or roasted, the mape fruit -that looks like chestnut- is highly prized by Tahitians that eat it at every hour. Childrens are used to selling those cooked fruits in all gatherings, notably around markets. The painapo, derived from the English word, find its origin in South America and was introduced by the famous captain Bligh that commanded the also famous Bounty. It is today the more cultivated plant in Tahiti but above all in Moorea where a juice factory has been built in order to transform the local production. The Tahitian variety is very thorny, but its taste is particularly strong and its yellow flesh is really sweet and perfumed. The origin of this plant is still unknown today since it was cultivated for thousand years, but it was disocvered by conquistadors in Central America.The fruit constitutes with banana one of the more eaten fruits in French Polynesia for its production doesn’t know any season. It can be eaten raw with citrus juice, or cooked notably inpoe, a sort of Tahitian pudding served with coconut milk. It has also many properties : it can make freckles disappear applying the pressed green fruit, or blood spots on cloth thanks to leafs decoction. Passion fruit finds its origin in Brazil, Paraguay and Argentine and has amazing hermaphrodit flowers and lianas which stems end in tendrils. Its fruits are filled with an intense yellow matter in which are spared many little black seeds. Among 20 comestible species, 3 species of passion fruit are cultivated in French Polynesia, notably to make a delicious juice. The round intense yellow skin variety is very common but its flesh is often acid, whereas the garnet-red skin variety is much sweeter and has a more agradable taste. Guava was introduced in Tahiti at the early XIXth century from Brazil. It quickly developed to the detriment of the indigenous vegetation. However -as Polynesian people have understood it- this plant has both many medicinal properties -since they added it to their list of medicinal plants- and undeniable gustatory qualities. Actually, the “sandy plum” -as Aztecs used to call it because of its uncountable seeds- is the base of delicious fruit juices and highly fine jelloes. Unfortunatly, this plant grows in steep hills, difficult to acceed. As a consequence there is a lack of labor and the production keeps falling down. For a neophit, it is sometimes difficult to make a difference between those two members of the Sapindaceae family. Actually both of them are characterized by a red envelop and a white fruit which pulp sticks fermly to the stone. The Chinese cherry fruit, more commonly called lychee, is the more prized of the two fruits even thought it doesn’t grow in French Polynesia as well as its cousin the ramboutan since he prefers more fresh climates. As for the ramboutan, it finds its origin in South-east Asia and its envelop seems to wear sorts of sparks that doesn’t appear on lychee. The first orange trees were introduced in French Polynesia by navigators. The oranges that were produced then were so tasty that quickly, Tahitian people planted it everywhere : either in coasts, in valleys or in mountains. Unfortunatly, insects and deseases destroyed many orchads around 1870 while more than 1,750 tonnes of fruits were exported to California every year. Today, wild orange trees only survive on isolated mountainous plateaus, notably in the Punaruu valley (Tahiti) where they are the subject of a ritual harvest in June. This “star fruit” finds its origin in South-east Asia and was given his name because of its five branches star shape when sliced. Pretty acid, the juicy carambola fruit is not very prized and often ends on the ground or eaten by birds. However, its medicinal properties are still used today in Malaysia. From Borneo, this fruit was introduced in Tahiti in the early XXth century and since 1930, the first trees produced fruits. In some plantations, the Sarawak grapefruit tree even replaced the orange tree introduced few years before and affected by insects and deseases. Today, it is one of the more common fruit of Tahiti and her islands but its acidity makes it not very prized by Tahitians that still prefer oranges. Thus, victim of overproduction, the more important plantation of Tahiti has been replaced by a golf cours. The vi popa’a (foreign mango), in opposition to the Tahitian vi, is from Indo-Burma and was introduced in Tahiti for the first time in 1848. It was quickly adopted by Tahitian people who used its trunk notably to build their canoes. After banana, it is the most produced tropical fruit in the world where 300 species are cultivated. The different varieties that are cultivated in Polynesia don’t ripen at the same time what allows to find mangos all the year long. The grafted trees provide much more tasty fruits while the other fruits have a strong turpentine taste. Most of Tahitian people appreciate the green fruit or or the fruit soaked with Chinese cherries. This high tree is to be found from Madagascar to Japan, not to forget Fiji and French Polynesia. This natural dispersal is dued to its nut peculiar quality to float during long periods without loosing its capacity to germinate. The “Indian almond” as it is sometimes called has a better taste roasted than raw. Its leafs -that fall down once a year- are used in traditional medicine and its wood -that resists to water- in woodwork and shipbuilding. Watermelon is a creeping plant from Africa. Two varieties are mainly cultivated, especially in the coral belts that surround Maupiti and Huahine islands. One is a small deep green rounded fruit, and the other is bigger and more elongated with a mottled pale green skin. Served fresh, watermelon is trully delicious and slakes everyone’s thirst. Polynesian people also use its skin boiled in salted water to fight the consequences of ciguatera, a desease that is transmetted from algae to fish and then to men. With the fei -a banana that can only be eaten cooked- and the uru (breadfruit), thetaro is part of the winning trio that was to be found on Polynesian tables before the Europeans’ arrival. Actually, the tuber is very rich in starch and the young stems (fafa) as well as the young leafs (pota) can be eaten with coconut milk -as spinachs can be cooked with cream. The taro can also be prepared as popoi : first, the tuber is cooked and crushed ; then it is put in ti leaves and can be kept during 3 weeks after the preparation. Since it grows easily and fastly, sweet potatoe is one of the most cultivated tubercular plant around the world. Moreover, its flesh -that can be pinkish, white or yellow- is very rich in vitamins and minerals. Nowadays, the former Polynesian varieties have disappeared to be replaced by introduced varieties that are actually more productive, more tasty and more nourishing. Formerly, manioc didn’t exist in French Polynesia : it was imported from South America in 1850. Sooner it replaced advantageously the pia, which was traditionnaly used for its starch to prepare poe -a sort of Tahitian pudding prepared with fruits and served with coconut milk. Actually, manioc can grow in poor grounds, demands few attention, prefers the dry season, moreover its root can also be eaten -which is not true with pia-and finally manioc is much more productive. But since a few dozen years, manioc culture has been partialy abandoned and starch has to be imported to provide the local market, thought it is often more expensive and of poor quality. Four varieties of yam existed in Polynesia before the Europeans’ arrival. One of the varieties, the ufi yam, gives enourmous tubers that can reach up to 15 kg of weight.The main advantage of this plant is its harvest period, during the dry season. Actually, at this period of the year -from April to October- the breadfruit tree (uru) doesn’t give anymore fruit so that yam permited locals to survive between two uru harvests.